I am so making this with leftover turkey on Saturday after turkey day. Friday is made for sandwiches, and everyday after that as well. But I will make one other thing with the leftovers that can last a few days and it is this soup. Filling and nourishing after what will be a weekend of indulgent yet wonderful meals. I hope you, your family and friends have a lovely time together! Original: Fall is my favorite season, a close second is Spring. I think it may have to do with change, the change of the air, the slowing down of things. The crisp air really calls to me, and invites me to make comforting food, read more, and curl up with blankets. It’s me. Then in the Spring, I will remember that is a part of me as well. In the yard, dirt in hands, getting ready for the renewal and waking of flowers. But for now, it’s the slow down taking a deep breath and remembering to take it all in, this ride I am on at the moment. Yesterday I spent the morning with seventh graders teaching them how to make tortillas from scratch on a farm, in a red barn. Epic. As I turned to go to this farm on Sauvie Island, north of Portland, there is a bridge. As I drove across the bridge a sigh of relief came over over me. A natural deep sigh. I felt refreshed and happy. It is picturesque. A flowing river below, and into the distance, drizzle of rain, farm land everywhere around me. That is what sustains us. I will post more on what I was doing out there with the kids very soon, because I had a blast, it was natural and so fun for me. Remember when I went to work on the farm for the Red Barn Dance Event, it was the same farm, Sauvie Island Center. I made this soup, to nurture and keep us healthy. 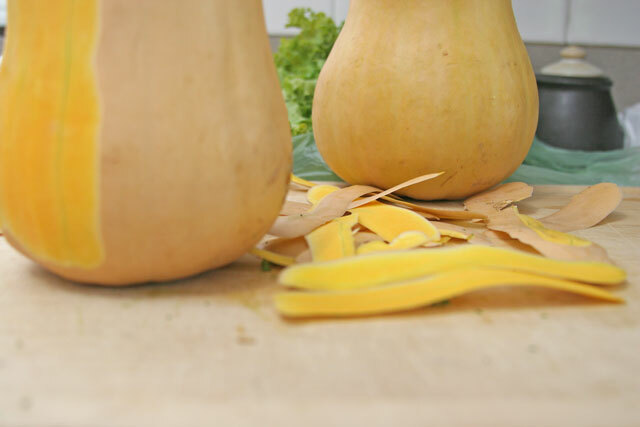 I love kale in soups, and I love butternut squash. But I wanted something different than the pureed version that I have an obsession with. I needed something that would fill me up, get me through a five hours class without a problem. I found it, no joke. This soup fills your souls and tummy for days! It is healthy, nutritious and delicious. Try it and let me know what you think! Note: To make the broth super flavorful, I used chicken stock and made chicken broth. If you didn’t know… Broth is made from chicken meat, stock is made from the bones. If you have any questions about this, please feel free to ask me! You can make this vegetarian by using vegetable stock and obviously omitting the chicken. 6 medium chicken thighs bone in, or a whole chicken, whatever you have on hand. 1. In a large Dutch oven or heavy bottom large pot, add 1 tablespoon of olive oil over medium heat. 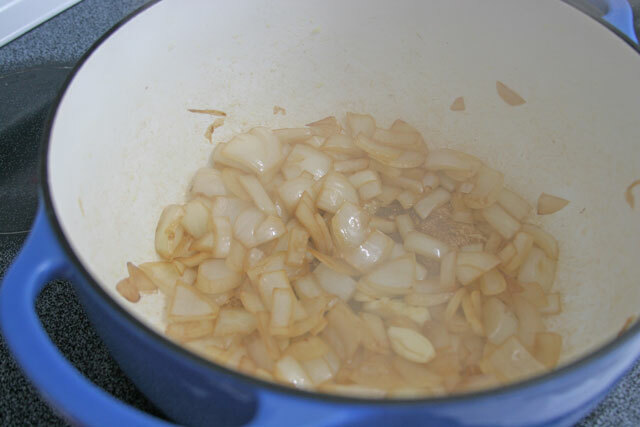 Add the medium diced onion, sprinkle a small pinch of salt over the onions and stir. Allow onions to brown for 10 minutes or so. Turn the heat down if they begin to burn. No burnt onions here. Add the whole garlic cloves and cook for 2-3 minutes. Cover with 6 cups of chicken stock, add the chicken. Bring to a boil, reduce to a simmer. Add the bay leaf and thyme bunch. Do not add salt yet. Cover and cook for 35-40 minutes over medium low heat. You want a constant simmer while cooking, not a boil. 1. 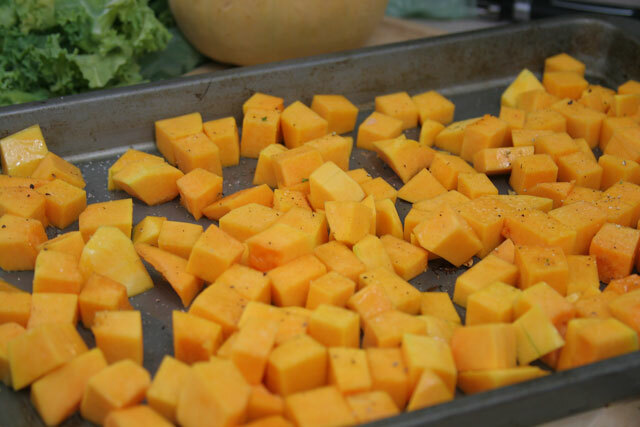 While the chicken is cooking peel and dice the butternut squash. Place on a roasting pan, drizzle with 1-2 tablespoons olive oil, sprinkle 1/4 tsp salt, and pepper. Roast in the oven for 20-30 minutes. 2. Once the chicken has been cooking for 35-40 minutes, turn the heat down to low, remove the chicken, place in a bowl to cool, set aside. Remove the thyme bunch and the bay leaf from the broth, discard. Add 1 teaspoon of salt, and 1/2 tsp pepper to the broth. Add the quinoa, and cook for 15 minutes. Shred the chicken. 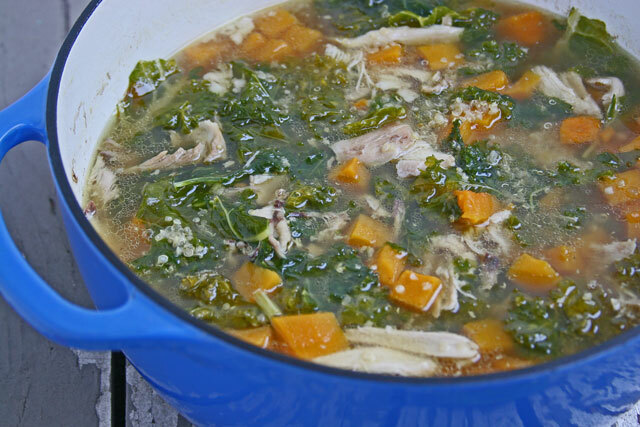 Once the quinoa is cooked, add the shredded chicken back to pot, add the butternut squash, and kale. Taste. Does it need more salt or pepper? Add a small pinch now. Stir in and taste again. Adjust the seasoning if needed. Serve with corn bread, a crusty bread, or just enjoy solo! I am so hearting the idea of you showing kids how to make tortillas! Aww. Can’t wait to see the post! Thanks! That is what I do, I love teaching kids about food. Mmmmm… love the flavors going on in this soup! Thank you! It is so filling too. Hi Fabi, I was in the Diane Morgan class with you last weekend, and enjoyed this lovely soup! And now I’ve found it on your blog! My CSA box this week will be perfect for the vegetarian version – I’m posting this week at urbanfarmtable.com. Thanks for the delicious recipe (and lovely lunch!). Such a perfect, comforting (and healthy!) fall recipe. I’m totally in the soup zone these days, it’s all I want to make. This is a great recipe, thanks for sharing! Thank you! Hope you like it, it is so good. Fall is my favorite season as well! Especially because of soups like this one.